In order for an overcurrent protective device to operate properly, the overcurrent protective device ratings must be properly selected. Of the three of the ratings, perhaps the most important and most often over-looked is the interrupting rating. If the interrupting rating is not properly selected, a serious hazard for equipment and personnel will exist. Current limiting can be considered as another overcurrent protective device rating, although not all overcurrent protective devices are required to have this characteristic. The voltage rating of the overcurrent protective device must be at least equal to or greater than the circuit voltage. The overcurrent protective device rating can be higher than the system voltage, but never lower. For instance, a 600V fuse or circuit breaker can be used in a 208V circuit. One aspect of the voltage rating of an overcurrent protective device is a function of its capability to open a circuit under an overcurrent condition. Specifically, the voltage rating determines the ability of the overcurrent protective device to suppress and extinguish the internal arcing that occurs during the opening of an overcurrent condition. If an overcurrent protective device is used with a voltage rating lower than the circuit voltage, arc suppression and the ability to extinguish the arc will be impaired and, under some overcurrent conditions, the overcurrent protective device may not clear the overcurrent safely. The voltage rating is required to be marked on all overcurrent protective device labels. NEC® 240.60 (A)(2) allows 300V type cartridge fuses to be permitted on single-phase line-to-neutral circuits supplied from 3-phase, 4 wire, solidly grounded neutral source where the line-to-neutral voltage does not exceed 300V. This allows 300V cartridge fuses to be used on single-phase 277V lighting circuits. 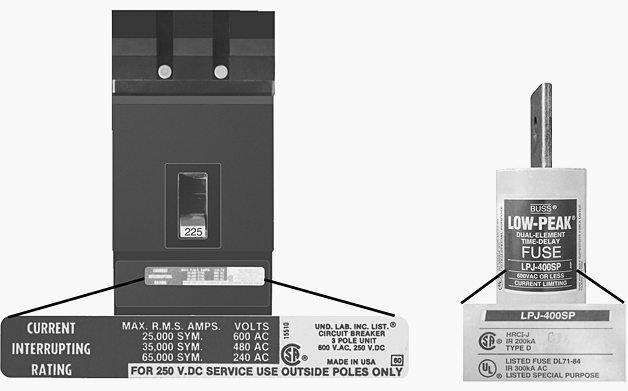 Per NEC® 240.85, a circuit breaker with a slash rating, such as 480Y/277V, can only be applied in a solidly grounded wye circuit where the nominal voltage of any conductor to ground does not exceed the lower of the two values and the nominal voltage between any two conductors does not exceed the higher value. Thus, a 480Y/277V circuit breaker could not be applied on a 480V corner grounded, because the voltage to ground exceeds 277 volts. It could not be used on 480V resistance grounded or ungrounded systems because they are not solidly grounded. Every overcurrent protective device has a specific ampere rating. In selecting the ampere rating of the overcurrent protective device, consideration must be given to the type of load and code requirements. The ampere rating of a fuse or circuit breaker normally should not exceed the current carrying capacity of the conductors. For instance, if a conductor is rated to carry 20A, a 20A fuse is the largest that should be used. As a general rule, the ampere rating of a fuse or a circuit breaker is selected at 125% of the continuous load current. Since the conductors are generally selected at 125% of the continuous load current, the ampacity of the conductors is typically not exceeded. However, there are some specific circumstances in which the ampere rating is permitted to be greater than the current carrying capacity of the conductors. A typical example is the motor circuit; dual-element fuses generally are permitted to be sized up to 175% and an inverse time circuit breaker up to 250% of the motor full-load amperes. NEC® 240.4(B) allows the next higher standard overcurrent protective device rating (above the ampacity of the conductors being protected) to be used for overcurrent protective devices 800A or less provided the conductor ampacity does not already correspond to a standard overcurrent protective device size and if certain other conditions are met. NEC® 240.4(C) requires the ampacity of the conductor to be equal to or greater than the rating of the overcurrent protective device for overcurrent devices rated over 800A. NEC® 240.4(D) requires the overcurrent protective device shall not exceed 15A for 14 AWG, 20A for 12 AWG, and 30A for 10 AWG copper; or 15A for 12 AWG and 25A for 10 AWG aluminum and copper-clad aluminum after any correction factors for ambient temperature and number of conductors have been applied. NEC® 240.6 lists the standard ampere ratings for fuses and inverse time circuit breakers. Standard amperage sizes are 15, 20, 25, 30, 35, 40, 45, 50, 60, 70, 80, 90, 100, 110, 125, 150, 175, 200, 225, 250, 300, 350, 400, 450, 500, 600, 700, 800, 1000, 1200, 1600, 2000, 2500, 3000, 4000, 5000 and 6000. Additional standard ampere ratings for fuses are 1, 3, 6, 10 and 601. The use of non-standard ratings are permitted. NEC® Article 100 defines interrupting rating as: The highest current at rated voltage that a device is intended to interrupt under standard test conditions. An overcurrent protective device must be able to withstand the destructive energy of short-circuit currents. If a fault current exceeds the interrupting rating of the overcurrent protective device, the device may actually rupture, causing additional damage. 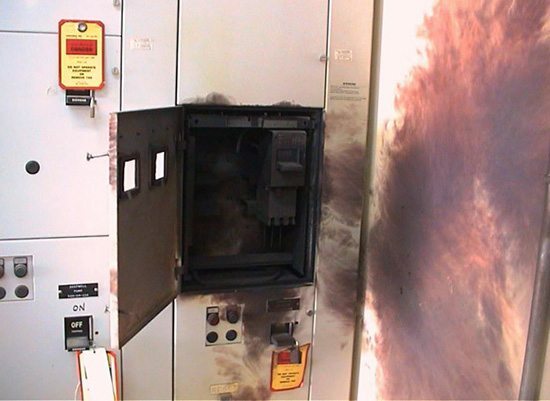 The picture below illustrates how considerable damage can result if the interrupting rating of a protective device is exceeded by a short-circuit current. Thus, it is important when applying a fuse or circuit breaker to use one which can physically interrupt the largest potential short-circuit currents. NEC® 110.9, requires equipment intended to interrupt current at fault levels to have an interrupting rating sufficient for the current that must be interrupted. This article emphasizes the difference between clearing fault level currents and clearing operating currents. Protective devices such as fuses and circuit breakers are designed to clear fault currents and, therefore, must have short-circuit interrupting ratings sufficient for all available fault levels. Equipment such as contactors and switches have interrupting ratings for currents at other than fault levels, such as normal current overloads and locked rotor currents. NEC® 240.60(C) states that the minimum interrupting rating for a branch-circuit cartridge fuse is 10,000A. 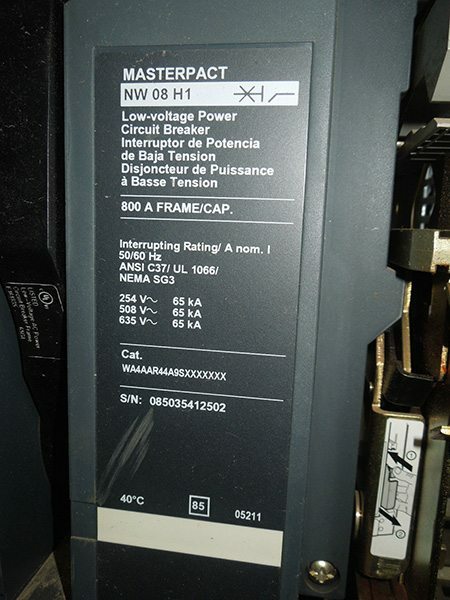 NEC® 240.83(C) states that the minimum interrupting rating for a branch-circuit circuit breaker is 5,000A. The circuit breaker or fuse must be properly marked if the interrupting rating exceeds these respective minimum ratings. These minimum interrupting ratings and markings do not apply to supplemental protective devices such as glass tube fuses or supplemental protectors. Modern current-limiting fuses such as Class J, R,T and L have a high interrupting rating of 200,000A to 300,000A at rated voltage. Molded case circuit breakers typically come in a variety of interrupting ratings from 10,000A to 200,000A and are dependent upon the voltage rating. Typical incremental interrupting ratings for a single series of circuit breakers may be 14kA, 25kA, 65kA and 100kA at 480V. 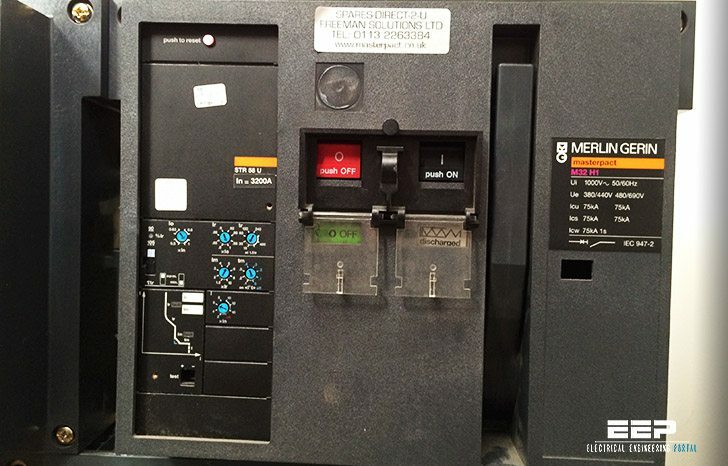 As interrupting rating of circuit breakers increases, so does the cost of the circuit breaker. 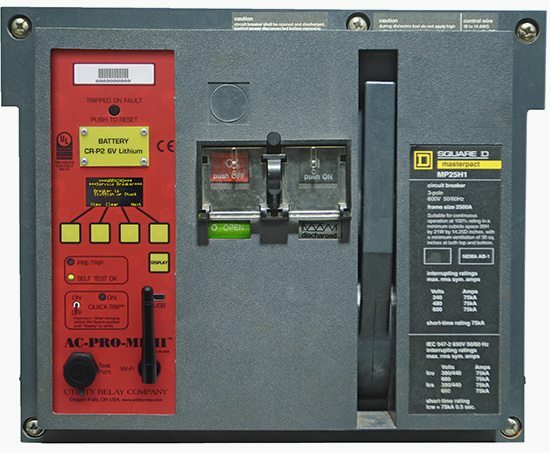 Typically the circuit breaker that just meets the required available fault current is selected. However, this may be insufficient in the future if changes to the electrical system are made. – 40.60 // covers the general requirements for cartridge type fuses and fuseholders. This includes the requirements for 300V type fuses, non-interchangeable fuseholders, and fuse marking. – 110.9 // requires equipment intended to interrupt current at fault levels to have an interrupting rating sufficient for the nominal circuit voltage and the current that is available at the line terminals of the equipment. – 240.85 // covers the requirements for the application of straight (such as 480V) and slash rated (such as 480/277V) circuit breakers. Additional consideration of the circuit breakers’ individual pole-interrupting capability for other than solidly grounded wye systems is indicated. – 240.4 // requires conductors to be protected against overcurrent in accordance with their ampacity as specified in 310.15. 240.4(B) typically permits the next standard overcurrent protective device rating, per 240.6, to be used if the ampacity of a conductor does not correspond with a standard rating (for overcurrent devices 800 amps or less). – 240.60 // covers the general requirements for cartridge type fuses and fuseholders. This includes the requirements for 300V type fuses, non-interchangeable fuseholders, and fuse marking. – 240.83 // covers the marking requirements for circuit breakers. I like the good job you re doing please keep it up. There are other aspects as well namely settings – overcurrent, short circuit, instantaneous current. I appreciate your enthusiasm & efforts to cover all the fields of Electrical engineering. I feel O/C condition means continuous Over Current only, that too relays of O/C start functioning at 1.3 times the set current setting(plug setting multiplier) & the time taken to operate the O/C relay, MCCB or a fuse depends up on the characteristics of the item/device used for protection. As far as CTs are concerned, the continuous current carrying capacity is 1.2 times the rated current.As far as Voltage rating is concerned ,it has to be little higher than the rating of the supply voltage,that is about 10% higher to take care for highest system voltage at supply frequency.